This year to mark the occasion of World Toilet Day, WBCSD participated in an event in Geneva, organized by the Toilet Board Coalition (TBC) in partnership with Water Supply and Sanitation Collaborative Council (WSSCC) and SDG Lab to highlight the role of businesses in scaling-up sanitation solutions. In 2010, the United Nations explicitly recognized the Human Right to Water and Sanitation as a prerequisite for the realization of other human rights. 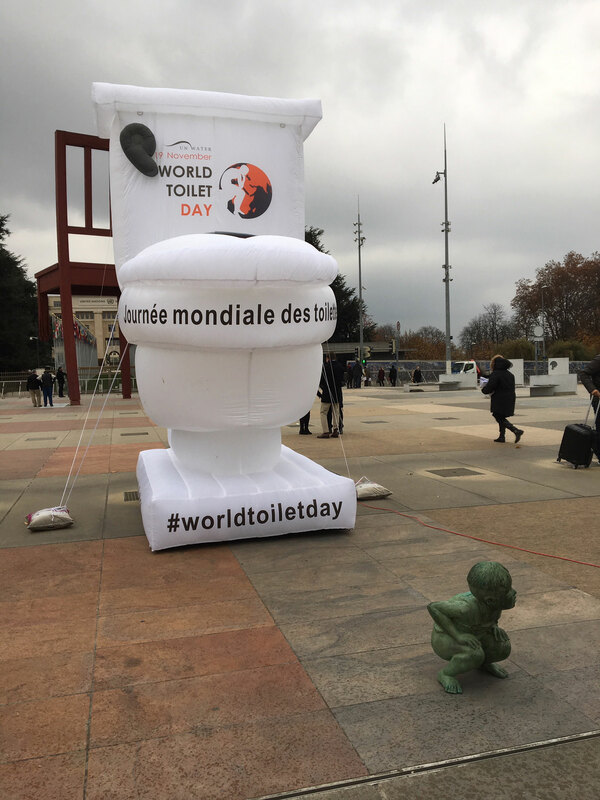 In 2013, a resolution on ‘Sanitation for all’ was declared by UN General Assembly and 19 November was recognized as World Toilet Day. The resolution urges all stakeholders to encourage behavioral change, increase access to sanitation among the poor and end open defecation. Since then, UN-Water co-ordinates World Toilet Day every year in partnership with government and relevant stakeholders with an intent to inspire action to tackle the global sanitation crisis. Within this, business has great potential and an important role to play in helping the world advance on this global agenda. This year to mark the occasion of World Toilet Day, WBCSD participated in an event in Geneva, organized by the Toilet Board Coalition (TBC) in partnership with Water Supply and Sanitation Collaborative Council (WSSCC) and SDG Lab to highlight the role of businesses in scaling-up sanitation solutions. Given the immense untapped potential for innovating, deploying treatment technologies, recovering resources and putting them to use, businesses have opportunities to tap into the so-called ‘sanitation economy’. Businesses can work to make new solutions viable and marketable; they have the reach to influence behavior and bring about the change that is needed. and the ‘Smart sanitation economy’ which uses data derived from toilets to help predict and manage public health. Firmenich presented their work on making toilet use more attractive to drive usage. WBCSD also shared the results of the WASH at the Workplace Pledge, signed by 48 multi-nationals which are delivering access to safe water, sanitation and hygiene to over 2.6 million employees at the workplace in over 170 countries. In addition, the event facilitated the dialogue with government and the role they play in creating an enabling environment to attract private sector participation as an innovator, investor and implementor. Government representatives from Austria, Mongolia, Pakistan and Singapore, also supported the conversation. The session underlined the need for a new narrative to change the mindset from toilets and sanitation being just a cost, to being part of a new circular economy with business opportunities. This completely relates with the need and opportunity as depicted by a research conducted by Toilet Board Coalition in 2017 on "sanitation economy" which estimates a market potential USD $62 billion in India alone and the World Bank estimates of overall global investment of USD $1.14 trillion per year to meet SDG 6.1 and 6.2. Thus, this transition in the sanitation economy presents a transformational opportunity to ensure a sustainable future in sanitation systems and WBCSD will continue to support businesses to be a part of it by providing leadership opportunities for advancing action in the WASH space. It will represent the business voice at global policy advocacy platforms and assist businesses in fostering partnerships in the sanitation economy for essential contribution to SDG 6.